The SP 500 has rallied up into the 1375/77 pivot areas as I had outlined to my subscribers about 10 days ago on the weekend update as possible highs for C wave up from the 1267 SP 500 lows of June. Many forecasters are now getting very bullish, but I continue to see divergences with The Elliott Wave counts and other indicators that are giving me some short term concerns, and then we can determine if these are long term issues still for the markets. Today’s Independence Day update shows a new chart pointing out prior “Recovery rally highs” since the May 2011 1370 highs on the SP 500. In each case, a major market correction unfolded when we had the NYMOT indicators at these levels along with Stochastics, CCI, and other Fibonacci indicators I incorporate at various times. Currently, we have the NYMOT indicators at a reading of 307. To understand this in context, its the highest reading in the past two years. Higher than the 1292 SP 500 rally high in October 2011 (From 1074) and higher than any other rally high in the past 24 months. Adding to that, we have the Stochastics indicators at extreme short term highs and the CCI index is nearing the levels it read at the recent 1363 pivot highs. Finally, further puzzle pieces continue to show divergences in the Elliott Wave patterns. The rally from 1267-the current 1375 levels can’t be interpreted in my opinion as a 5 wave rally (which would be bullish), instead its an overlapping 3 wave rally in my views., or a double zig zag. 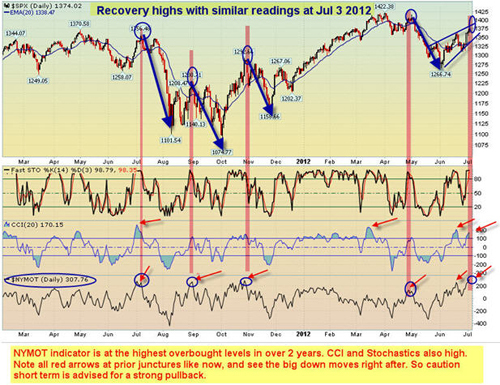 These types of rallies are corrective rallies against a prevailing trend, which was down in to early June. The rally to 1375 areas is actually in the zone I discussed a few weeks ago, and still in the 1386 or lower Fibonacci zone I’ve outlined as a C wave target for an ABC rally from 1267 June 2012 lows. My work still gives a model of 1422-1267 as 5 waves down, and 1267-current as a zig zag corrective pattern up. The market will soon tip it’s hand I think after this holiday week is over and we see a bit more volume return next week. With all of this said, it is difficult to be too bearish given the 52 week highs in many blue chip stocks as well as the strong advance-decline lines and recovery in some of the tech stocks of late. When you get a lot of conflicting signals like this, I try to fall back on a variety of indicators and clues to help clear up the clouds of the market.